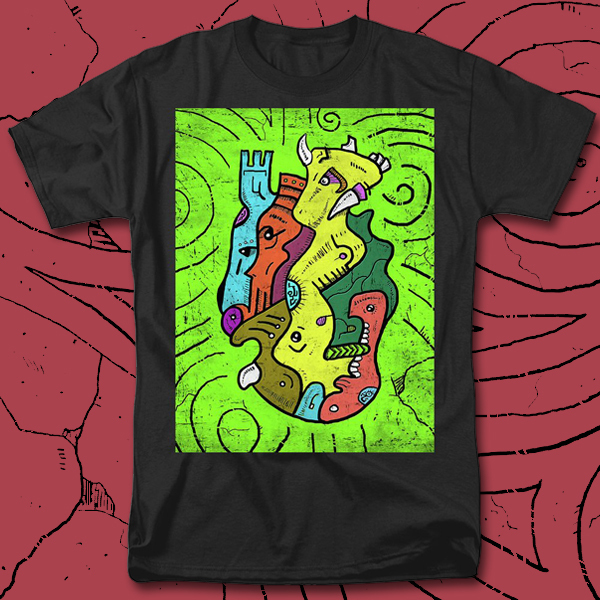 Psychedelic Animals shirt is surrealism style colour illustration where it seems like mystical animals are together in harmony. T-shirts for men and women, all t-shirts are made from 100% pre-shrunk, hiqh-quality cotton and are available in five different sizes. All t-shirts are machine washable. Shop from wide range of unique t-shirts designs. Find artistic and unique t-shirts and prints in our webshop. Worldwide shipping is available. In addition customers can buy many other art products. Bring your print to life with hundreds of different frame and mat combinations. Framed prints are assembled, packaged, and shipped by our expert framing staff and delivered “ready to hang” with pre-attached hanging wire, mounting hooks, and nails. Iphone 7 case to protect your iPhone 7 with an impact-resistant, slim-profile, hard-shell case. The image is printed directly onto the case and wrapped around the edges for a beautiful presentation. Simply snap the case onto your iPhone 7 for instant protection and direct access to all of the phone’s features!